»An intelligence agency is a government agency responsible for the collection, analysis, and exploitation of information and intelligence in support of law enforcement, national security, defence and foreign policy objectives. »The intelligence agencies help country to cope with security matters and to protect the nation from likely security breach; the core purpose of spy agencies is collection of secret information to secure the country from any internal and external happening which harm the stability of state either economically or politically. »American Crime News declared Pakistan Inter Services Intelligence as world’s best and strongest intelligence agency, headquartered in Shahrah-e-Soharwardi in Islamabad. 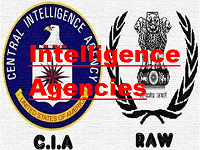 »India has a number of Intelligence agencies of which the best known are the Research and Analysis Wing, India’s external intelligence agency and the Intelligence Bureau, the domestic intelligence agency.